As announced earlier, BuildmLearn is accepted to participate in this year’s Google Summer of Code (GSoC) Program. GSoC is a global program organised by Google, that offers students stipends to write code for open source projects. Every year, since past 10 years, during this program Google works with the open source community to identify and fund exciting projects for the upcoming summer. The period for students to choose open source projects that interest them and apply to work for them has just ended yesterday. From the very day of being accepted into GSoC (i.e. Feb 24, 2004) we have received tremendous interests for students across the globe to participate in our projects. We have been busy answering the queries and discussing the project ideas with students on our Google group. We have collaborated with many students on our projects in the past so it wasn’t totally a new experience. To talk about some numbers, we have reviewed about 150 draft proposals by students before they submitted their final proposals to Google. Basically, we have successfully provided reviews and feedback to every student who requested it. We received a total of 258 proposals on Google, with a large number of drafts reviewed we kind of expected a high number of proposal submissions. 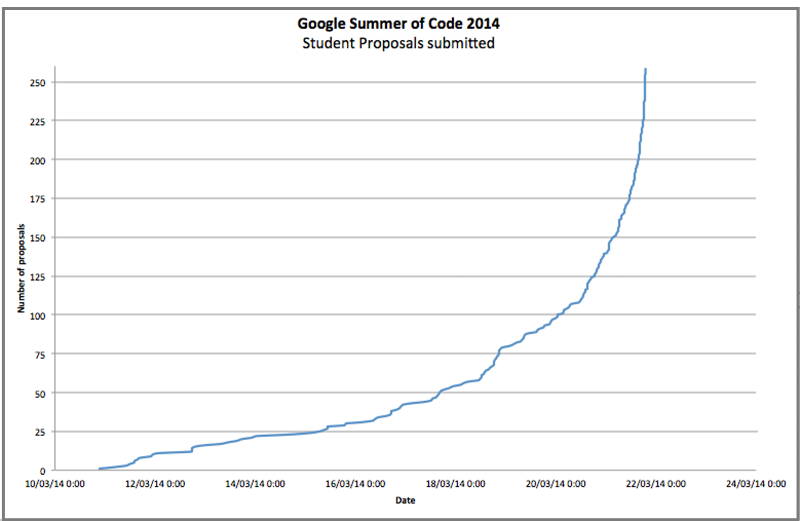 Here’s a graphical timeline of how the student proposals were submitted to us. As expected most of the proposals came in the last 4 days before the deadline. What can be said about the quality of proposals we’ve received so far is that there is a clear differentiation between applications from students who requested a review and ones who did not. We also noticed couple of proposals with very thin details and these can be considered substandard quality. However, the quality of a large number of proposals is very good and refined, so we are happy about that. Over the next weeks, our mentors would be reviewing these proposals, evaluating and ranking them internally based on quality. We hope to select the best students from the proposals we have received. This entry was posted in Events, mLearning, Open Source, Summer of Code and tagged Google, Google Summer of Code, GSoC 2014, MLearning, Open source. Bookmark the permalink.